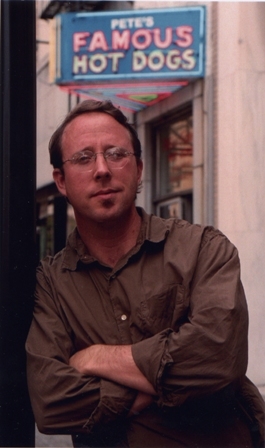 A prolific writer with a discerning palate, John T. Edge guides readers and home cooks through each city and recipe with authority. In his new cookbook Edge explores the exploding mobile street food movement across the country, including a Philly pit stop. John T. Edge, five-time James Beard Award nominee and well-known food culture chronicler, has watched this fast-growing trend with enthusiasm and excitement. That enthusiasm has taken him around the country to capture the food truck scene—which he does in The Truck Food Cookbook – a country-wide collection of today’s most imaginative dishes from some of the most creative chefs pedaling their wares curbside rather than inside. On Wednesday, June 6th, Yards Brewery will host Edge as he reflects on the experiences of his street food coverage, and signs copies of his new cookbook. A portion of the books sold will benefit the newly formed Philly Mobile Food Association (PMFA). This wouldn’t be a BigBite event without a little competition! In collaboration with the signing, and because we like competitions, BigBite will host a friendly cheesesteak competition between two PMFA vendors. Lil Dan’s Gourmet Lunch Truck and Spot Gourmet Burgers, Steaks and Pork will go head-to-head to see who can make the best Philly cheesesteak. They will be making these Philly staples for all to vote on, including John T. Edge. Yards Brewey also eggs this competition on by providing $4 Brawlers: a pugilist style ale. We hope you help us support the street food movement and join us on the 6th! It’s Saturday. Its Wing King, and you forget to Google the location where 20 competitors will go head to head for the Wing King crown?? It’s all good: We’re at the Ellen Powell Tiberino Memorial Museum at 3819 Hamilton St. (38th and Hamilton). Map here. The museum is in the middle of the block and is a bit hidden. 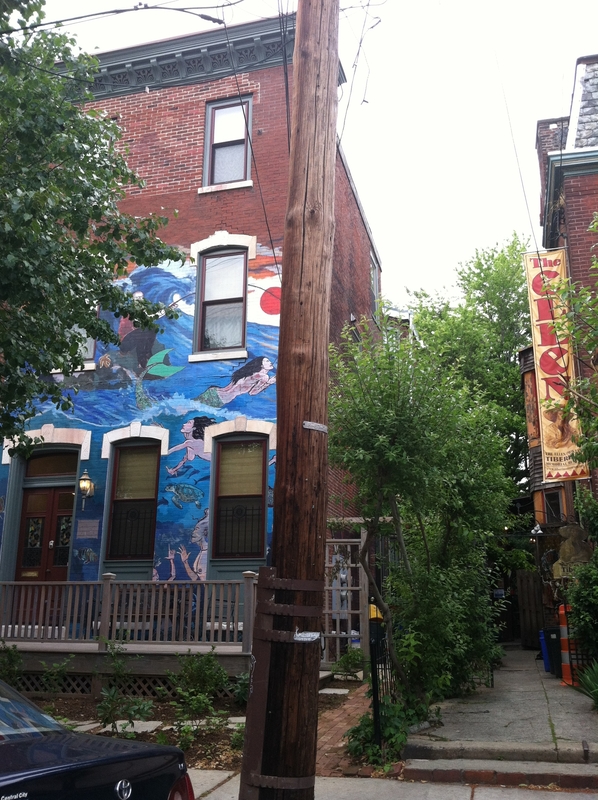 It is located next to this house with the blue mural. There is a Tiberino sigh next door. See you at this magical place! Who Wants It? Wing King IV Trophy! The question of the day is….WHO’S TAKING THIS CLUCKER HOME!?! 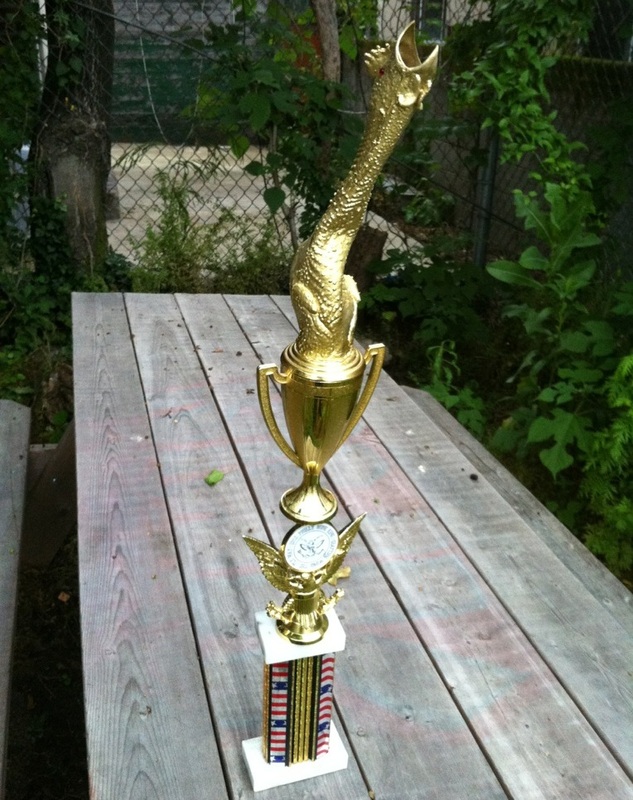 The Wing King IV winner will take home Beer For A Year provided by leading sponsor, Narrangansett, bragging rights for a year, and of course, the staple BigBite tradition, the home-made wang-tastic trophy!! It almost makes me want to be an IT geek when I see some of the amazing computer gadgets, gizmos, and hoo-has technology consultant Harold Shafer pulls out. Unfortunately, the custom media entertainment center designed by HaroldTech zaps my motivation and leaves me glued to the couch! If you’re looking to outfit your man cave or “lady lair” with a kickass entertainment system, I suggest you consult with Mr. Shafer first. Specializing in “cord cutting technology”, HaroldTech is able to lower your home and business communication bills- most times by more than 50%! (Say what???) Yeah, you heard right, that’s cable, phone, and internet bill money back in your pocket, so you can spend it on a new quilt, the baby’s daycare, or even Wing King IV tickets. If you’re tech illiterate or an advanced user, Harold also teaches cord cutting classes at Burlington County College. There’s even an iPhone, iPod Touch, and iPad class to show all the hidden secrets that’ll surely enlighten and bring the geek out of you. Feel free to text Harold or message him with any of your tech questions. BigBite has been entirely lucky with the amount of support we have gotten at all our events. On very important aspect of these events is capturing the epic and memorable moments that we can go back and cherish! We have too many pretty people attending these events NOT to capture them sucking on chicken bones and guzzling beer! We cannot thank Ashton Bridges Photography enough for holding our events down each year, each time!! We welcome her back to Wing King IV this Saturday to capture the magic again! You can see additional professional work the Ashton Bridges Photography facebook page or on Tumblr! Ashton will be attending the 4th Annual Wing King, so say hi or she’ll shoot you! IT’S BACK!! The Wing Ring is back!! As the big day gets closer, the competition seems to be working harder than ever! BigBite is seeing the wing-citment behind some of our contestants who are hungry for that Wing King IV trophy… and we are eating it all up! With that said, we are highlighting contestants who are ready to battle it out, boxing glove on one hand, wing sauce on the other. Let the WING RING begin. DING DING! Cat and Erik of “Cat Attacks” (that’s our team name, not our band name…although it would be a pretty great band name) are new to the Wing King, and wanging out in general. We’ve been participating quite a bit lately in cook-offs (2nd place Chili Bowl, what?!) and doing surprisingly well. Since we like a challenge, we decided to enter the Wing King IV despite having never made wings at home before. Lucky for us, we’re reigning champs of our friend’s annual Jerk-Off Competition (get your mind out of the gutter, it’s a jerk sauce grill-off! ), so we come half prepared with an awesome sauce that may or may not punch you in face, literally. While we don’t actually expect to place, we do expect to have a good time. With Cat’s wacky ideas and obsessive personality, and Erik’s taste-testing and vetoing skills, this should be a pretty interesting battle for us! Our next Wing King IV sponsor is guaranteed to have you in stitches. Literally. Longarm Services by Joyce will create a quilt for those special days (especially the sick ones) and that special someone (your anemic girlfriend.) Specializing in custom and computer digitized designs for the quilter, Longarm quilts make very personal, memorable, and also functional gifts. 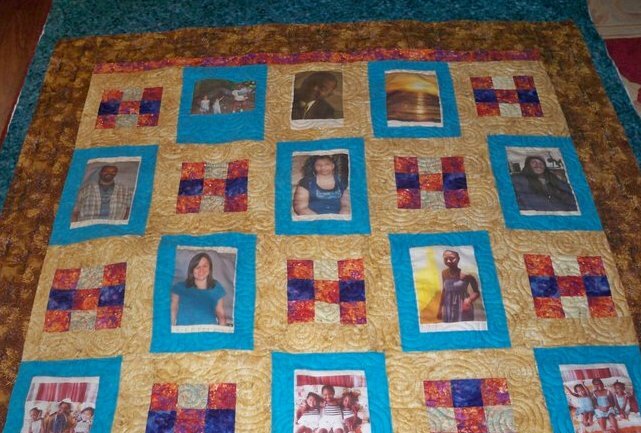 Give some special a memory quilt showcasing your special pictures. 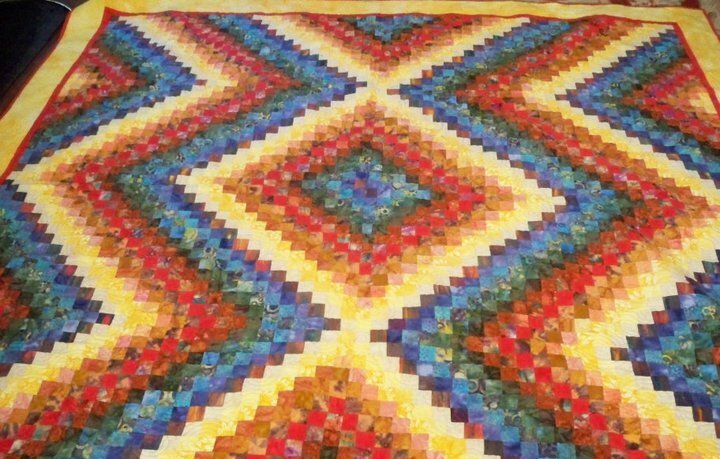 These quilts aren’t just blankets, but works of art. Unlike the holier than thou afghan, Longarm’s quilts don’t just look good draped over your grandma’s sofa. You can frame these jawns and it’ll look better than that watercolor still life you painted back in the day. If it’s a warm work of art you’re seeking, Longarm Services by Joyce has it sewn. Unsure of what you want on a quilt? Its cool, Joyce also has many quilts for sale. For more info, check out and like Longarm by Joyce’s Facebook.